In my discussion of federal political advocacy last issue, I mentioned that the politicians all seem to be very aware of and interested in our industry’s response to the need for flood coverage. I’m always quick to mention the terms “overland water” and “sewer backup” in the discussion because people need to know that the changing dynamics of these coverages seem to be merging them into one. In order to drive flood coverage towards premium adequacy, you can’t have one without the other in some markets. It’s a saleable perspective: if you are in an area where you should be concerned about a sewer backup, you should be also concerned about overland water. Most people will agree that the proximate cause of most sewer backup is actually overland water. Combining the two coverages eliminates “the chicken and the egg” claims discussion that generates public confusion and protest when one side of the street is covered. This random coverage is an ongoing issue because many companies are still not providing any coverage for “overland water” perils and are offering only the old “sewer backup” endorsement. This competing coverage is now both a public issue and a broker E&O nightmare. The failure of the insurers to develop a standard of coverage that is set out in common wording and is used by all companies referencing this protection will likely be a major issue for our business. No company or insurance adviser is immune from the confusion that will arise with the next catastrophic loss in a major urban centre. If we as brokers are advising clients to take coverage with one company or another but are confused by the variances in the wording and the special limits for “overland water” or “flood” coverage, we will not be able to describe the differences sufficiently for the client to understand the coverage and make an informed choice. Consequently, we will be held responsible for any shortfall in the coverage that causes the client an uninsured loss. Of course, the insurers will suffer the same challenges and may even be found liable to the public for failure to set a standard of coverage, but any liability charges would be years after the headlines sullying our reputations have long passed. The political perspective on disaster relief programs may further jeopardize public good will. Some provincial and federal politicians have suggested that the programs in place for uninsured losses from flood can now be reviewed and the budgets for them limited so that these funds can be freed up for other needed programs. Well, the reduction may not be that simple. As most brokers will tell you, “overland water” coverage is excluded for those living within 300 meters of running water and the new forms won’t likely even cover “sewer backup” for these folks. When these exclusions become apparent after the next weird weather event, don’t be surprised if you’re asked to explain what happened. I can’t help but note that, as I write, the community of Dawson Creek is suffering from just this kind of thing. I know everyone’s tired of hearing me quip that we are just three days of rain away from a repeat of the 2013 flooding that devastated Calgary and High River. I recently toured some of the work underway to mitigate the Highwood River’s potential to create havoc again. While mitigation is happening, we’re far from prepared to deal with the kind of flood we saw just three years ago. The issue of “broker” companies entering into the direct-writing business is always foremost in discussions between brokers. Of particular concern is the manner in which the competition takes place and the use of the data accumulated from the customers for further sales and marketing by both the brokers and the company. The other main concern remains the name by which the competition takes place. It should be clear to anyone that competing with your brokers by using the same name as that used to write the business the broker sends the company is seen as a breach of trust, a violation of the exclusivity anticipated in the contract between the broker and the company and just downright wrong! To further belabour the point, the public is also very confused when they see the same name on the insurance contract that is on the broker’s wall and advertising. They expect to receive service and advice from the broker. Well, this confusion will of course sort itself out, eventually. If a “broker” company wants to be a “direct writer” under the same name as it is a “broker” company, then it will damage the relationship. Their support from brokers may wane to their detriment. All things being equal, I believe they will either have to commit fully to participating in the marketplace one way or the other. This is quite a move for an affinity-group insurance company. Would a membership in the Automobile Association come as part and parcel with an insurance application? I wonder as well if the agent will get a fee for this part of the transaction. Auto clubs have affected the insurance industry before. The roadside assistance endorsement SEF 35 was created to provide a direct competitive response by the insurance industry to the entry of automobile clubs into the automobile insurance markets. An actual Auto Club package that provided some of the auto club services such as mapping and hotel planning used to be sold by brokers for one market. Now most that has gone by the wayside—no need to spend an hour talking about a road trip with someone when you can simply Google a route (complete with turning directions) and immediately get a whole bunch of information on all the amenities you might need on your trip. As in most of the travel industry, technology has taken over the heavy lifting, leaving little money for the service providers, but the affinity group of auto-club members continues to survive. In Alberta, their operations seem quite healthy, and they compete actively in the insurance and travel marketplace. I wonder if they will be appointing Alberta brokers to represent them. If not, I’m pretty sure they’ll be watching the success of the Ontario efforts closely. I know I will be. 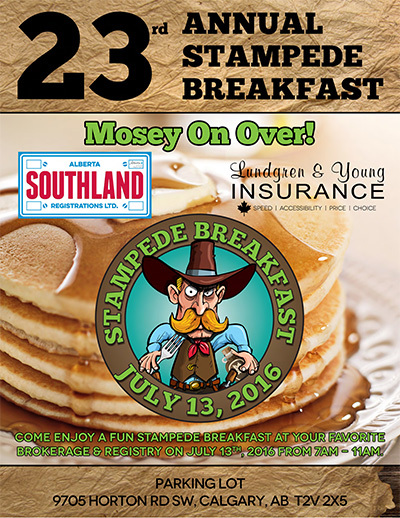 Stampede Breakfast in Calgary, Wednesday, July 13, 7:00–11:00 a.m.
Come and join around 1500 of our closest friends for a regular old-fashioned western whoop up. There’ll be lots to eat, world famous chuck-wagon drivers, line dancers, and a live band. It’s our 23rd time, and I think we’re starting to get it right. This has turned into an “all industry” event that you don’t want to miss. It starts early enough that even the 15 people in Calgary who do any work that week can get in on the fun before they get to the office. I’m working my way through the chapters of CAIB 2 covering business interruption and crime coverage and reviewing their content for relevancy and accuracy in our ever-changing marketplace. Reacquainting myself with the material is interesting: I find I learn more by teaching than I ever did by studying. As I’m plodding along with this project, the thought crossed my mind that those of you far more in tune with the current market than I am might have helpful contributions to these topics. If you, do I’d be happy to include them in my overview of the suggested changes to the instruction program. For example, we’ve come a long way from the old 3D wording as the basics for crime coverage, but all the new package stuff just builds on the old foundation. I wonder if tossing out the basics might hinder comprehension of the reasons the new package works the way it does. Many of you are far wiser on this topic than I, so I’d welcome your ideas. The email address below is my personal one. Feel free to drop me a note. Real life is stranger than fiction—watching the news these days sure hammers that saying home. The events unfolding to the south of us make me pause and reflect. The aberration that occurred in Orlando leaves me simply overwhelmed with grief for the people killed and injured and their families. I can make no comment that makes any sense of this. It is just so sad. Something has to be done. While I can hope for change, the lack of it after the massacre at Sandy Hook leaves me with a fatalistic view, believing that it will continue to get worse before it gets better. Pray I’m wrong!